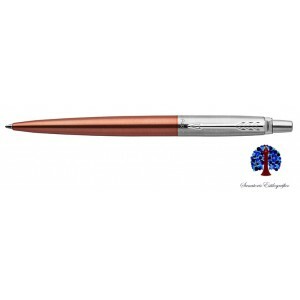 Jotter ballpoint pen finished in orange steel. The Jotter model captures the attention immediately and represents a true icon of the design in the last fifty years. Thanks to its attractive colors and its distinctive silhouette, Jotter remains the most popular piece of Parker, known even for its unique "click". Stainless steel body with careful and expert branding. Finished with a glossy clip shaped like stainless steel.